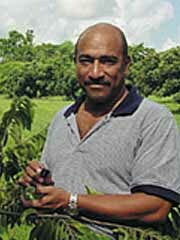 Jorge Peña is a pioneer in the development of biological pest controls for tropical and subtropical fruit crops. Agricultural pest control is a major problem in the tropics and subtropics where high temperatures and light intensity break down chemicals treatments, where the high numbers of insect life-cycles enhance the rate of resistance to pesticides, where rain washes away applications, and where pesticides which are banned in the United States find their way into developing countries. As a scientist at UF’s Tropical Research and Education Center in Homestead, Fla., Peña has shed light on the biology and ecology of both beneficial and harmful insects and mites associated with tropical fruit crops. Utilizing this fundamental information, he has developed effective, biologically-based pest management systems and published extension booklets to help farmers around the world with agricultural pest-management problems. Biological pest control is the focus of his current work with the citrus weevil. His objective is to identify beneficial insects that will control this weevil, which is causing more than $70 million dollars damage annually to citrus in Florida alone. Peña’s studies also determine whether a beneficial insect that is introduced will cause undesirable effects on native fauna. One of the released insects is a parasitic wasp obtained from Guadelupe. Since its introduction, this wasp has begun to parasitize 35 to 100 percent of weevil eggs in various plantings. In addition to research on pests, Peña has initiated the use of native pollinators of tropical fruit crops in order to assure good fruit set. Peña’s studies earned him the presidency of the Florida Entomological Society in 1993-94. He now serves on its editorial board, on review panels of the U.S. Department of Agriculture and the Food and Agricultural Organization of the United Nations, and on committees reviewing entomology departments in Latin American universities. He has published extensively, and twice has won the Krome Memorial Section Award for best paper by the Florida State Horticultural Society. Peña’s devotion to tropical entomology and to students and farmers around the world has resulted in the international standing of UF’s entomology program. Pe¤a has guided international post-doctoral fellows and visiting scientists, and has collaborated with colleagues in the United States, Latin America, the Caribbean, North Africa, the Middle East, southern Europe, China, and southeast Asia.